Akhenaten (meaning "living spirit of Aten") is one of the most famous and influential pharaohs of the ancient Egypt. He died around 1336 BC or 1334 BC. His name was ‘Amenhotep IV’ before he was ascended to the throne as the king of Egypt. 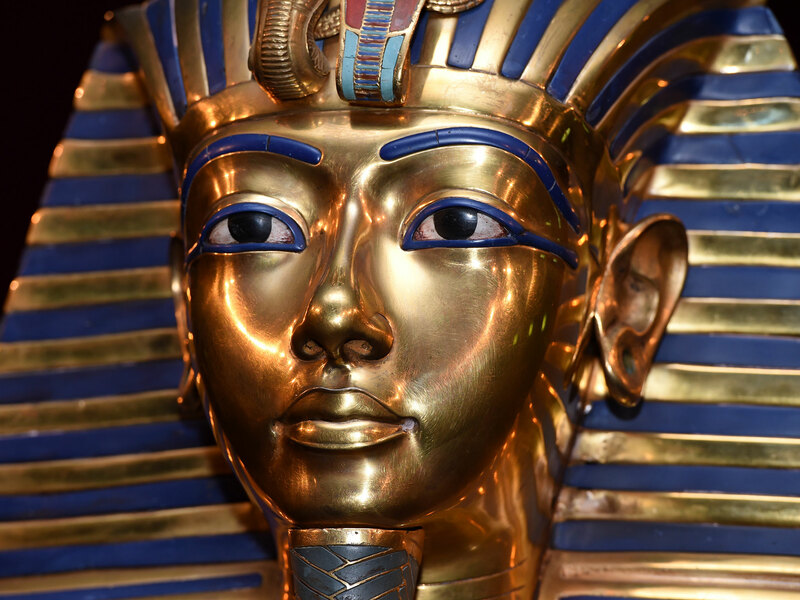 He is notably famous for the religious revolution and being the first monotheist Pharaoh in the history. Regarded as the direct descendant of Aten and divine, he not only considered himself as a God but was also worshiped by the whole Egypt. 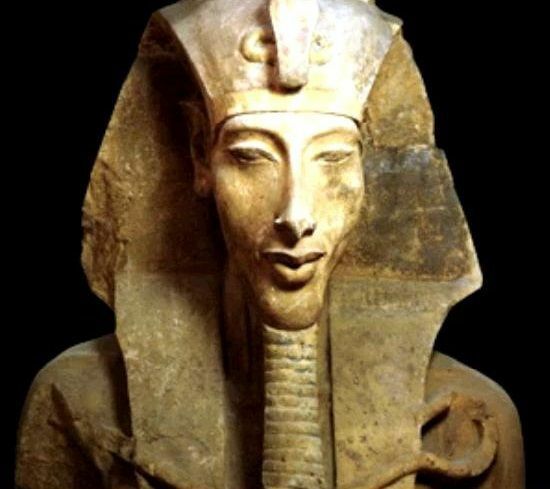 Akhenaten wasn’t originally throned as the ruler until the death of Thutmose his older brother. Known as the ‘heretic’ king, he was the tenth ruler of 18th Egyptian dynasty whose reign lasted for nearly 17 years(1353 BC-1335 BC). He was the younger son of Amenhotep III and Queen Tiye(pronounced as ‘Tee’). The Cairo museum houses the largest statue of the complete family. Amenhotep III and Queen Tiye had four daughters and two sons. They resided in the great religious center of Thebes, the city of the God Amun. 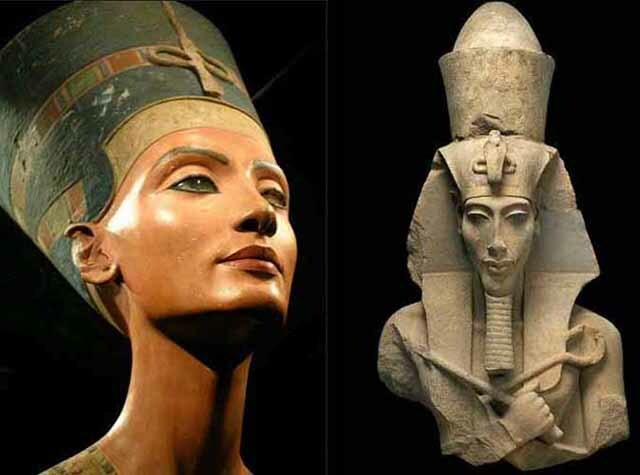 Nefertiti, known as “The Most Beautiful Woman in the World” was the consort of King Akhenaten. ‘Nefertiti’ is an Egyptian phrase which means"the beautiful one who has come". There is no information available in historical records about her parents. Tey was the wet-nurse of Nefertiti. Aye, Tye’s consort was Akhenaten's closest and most trusted adviser. Six daughters were born to Nefertiti and Akhenaten. Many remarkable family portraits have been seen in the museums that show a close relationship among the family members. The religious reformation that took place during the reign of Akhenaten, Nefertiti was a full partner of them as she can be seen worshipping alongside him in the pictures. Akhenaten had abandoned the Gods of Thebes. He had renounced polytheism and introduced sun-worship or worshiping of ‘Aten’ who was the sun disc (solar deity). For the first time in the 2000 years of Egyptian religious history, he had introduced the concept of monotheism ( a belief that says there is only one god). This was possibly done to weaken the priests’ political power. Thus, Pharaoh became the only link between people and Aten that had put an end to various temples. Akhenaten envisioned a sun disc in the middle of two mountains. He felt that he was being ushered by the God himself to bring about a change. He was shown God Aten as the sun disc- the Light. He felt as if Aten was guiding him to build a city between the two mountains. Akhenaten belonged to the era when Egypt was all in its imperial glory. Egypt was never so much wealthy, powerful and secure. Hundreds of temples were built in the honor of gods all over the Egypt, up and down the Nile River. It was their belief that Egypt will flourish if the Gods were pleased. And it did happen. In fact, showing the images of the entire royal family with elongated heads, faces, fingers, and toes became the new trend. The artists of Amarna had now got a new freedom to showcase something people had never seen before ‘the real-life of Pharaoh’. The temples were then covered with the beautiful pictures of Aten, the sun disc along with its rays shining in the downward direction that ended in hands holding ankhs, the hieroglyph for life. 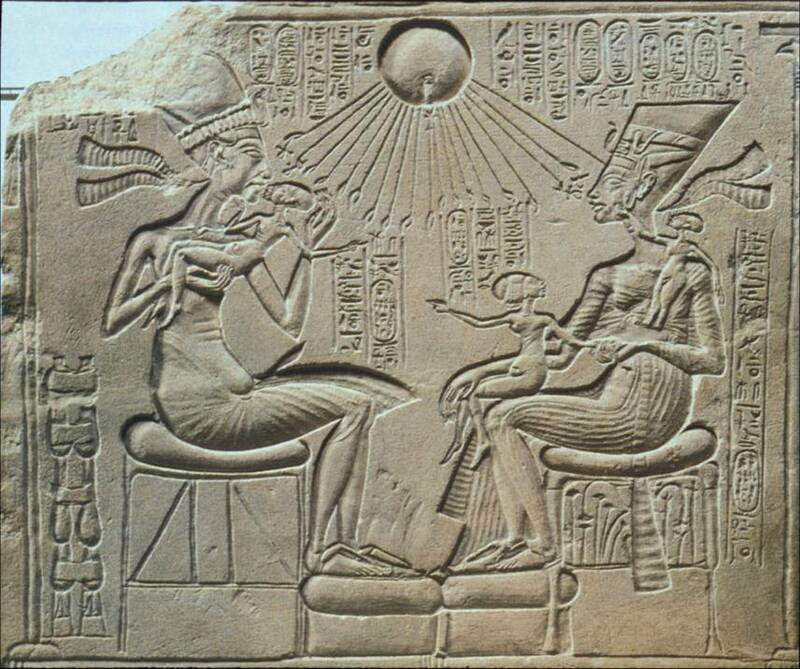 Akhenaten was the first Pharaoh who got real-life images and paintings of himself and his family. Akhenaten’s reign marked a significant shift in the art of ancient Egypt. The images of Egyptian gods including God Amun were replaced by images of Aten, the sun deity (solar disc). Even the images in Monuments saw a change of tradition with Akhenaten as he moved away from the typically shown strong, handsome and muscular Pharaoh. Akhenaten lived in his own world in Amarna for ten years while the things were getting worse in Egypt. He kept away from the problems of the people. He completely neglected the foreign policy and permitted the territories seized by Egypt to be taken back, however this image seems to be partially explained by the illustrations of the time, which understated his role as a warrior. Nefertiti is said to have disappeared and then possibly died around 1335 BC. 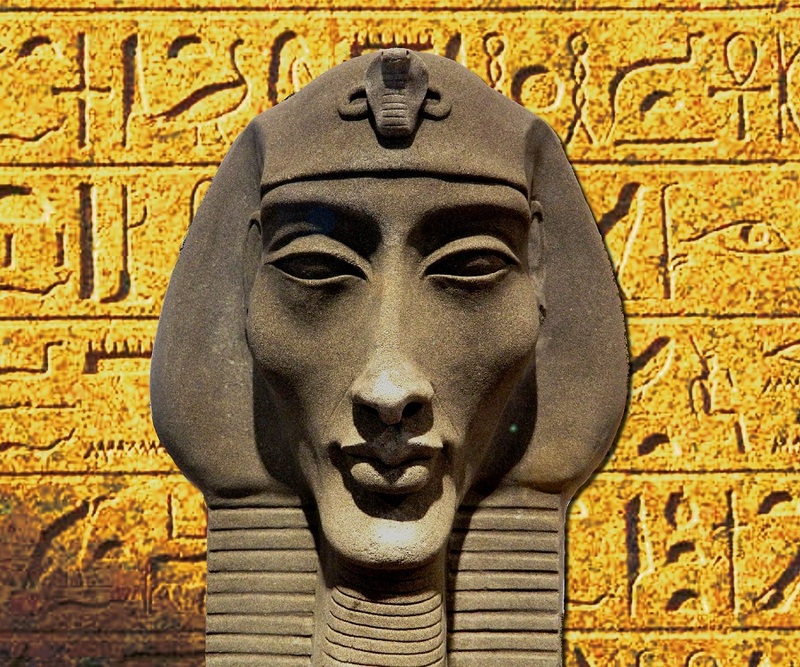 The death of Akhenaten happened around 1335 BC under unexplained circumstances. No records have been found about their death to-date, not even their burial place or mummy. Egyptologists have been trying to find out what really happened in his lifetime since much of the truth got buried along with his death. After the death of Akhenaten, the female Pharaoh ‘Neferneferuaten’ ruled Egypt for two years and one month. She was then succeeded by Tutankhaten who was later renamed as ‘Tutankhamun’. Tutankhamun was the son of Akhenaten. The country was administered by the chief vizier generals Ay and Horemheb. They reconstructed the temples of Amun, selected priests from the military and enabled the Pharaoh for firm control over the religious orders. But Akhenaten's followers at Amana abandoned the city as they didn’t understand what their Pharaoh had been preaching, and thus returned to Thebes and the familiar Gods with Tutankhamun as their King. Later on, the Pharaohs tried to erase all the memories of Akhenaten and his religion. Many of the buildings and distinctive art were demolished. Many of the Talatat blocks from the Aten temples in Thebes were reused during restoration work. Horemheb is thought to have made attempts to delete the traces of Atenism and the pharaohs associated with it from the historical record. According to this, the reports would say that Amenhotep III was immediately succeeded by him. The king lists compiled by later Pharaohs didn’t mention the name of Akhenaten in it until the late 19th century. Archaeologists then rediscovered his identity and unearthed the traces of his reign.